Since I was about 15, I have been teaching swimming lessons. - The kid who won't let go of the wall, go under water, has to go to the bathroom every 6 minutes, etc. - When practicing jumping in, they don't wait until you say it's their turn. They just go ahead and jump. On you. George, age 5, came swimming during the day after lessons that morning. It was a cold day, but he was showing me his tricks off the diving board. Me: Go get your towel! George: No! Real men don't use towels. Alex: Do you have any babies? Alex: You should make some. Me to class of 3 year olds: Do you guys have any questions? (Every hand goes up): I went to the zoo yesterday. Have you seen the Emperor's New Groove? I'm being a dinosaur for Halloween. Me: Did you have a good Halloween? Nathan: My dad ate all my candy. It's a party, really. 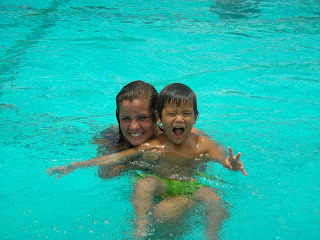 Even though they kick water in your face the majority of the time, some of those kids are just beyond adorable. THAT is what makes it worth it! This is the most relateable post of my life. Oh swimming lessons haha. this post makes me want to teach swim lessons too. That kid Alex has a point!